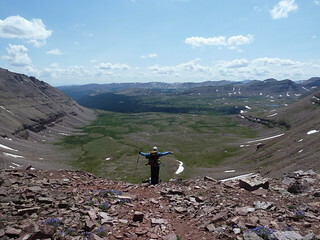 An extended trip to the highest peak in Utah, in the High Uintas. 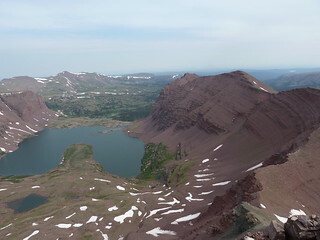 For our Memorial Day trip, Tory and I let Idaho Hiking Club choose where we went; the options were Kings Peak (Utah), Eagle Creek (Oregon) or Wheeler Peak (Nevada). They picked Wheeler, then a few weeks later Tory led a trip to Eagle Creek. So when our 4th of July trip came around we decided to finish it up with Kings Peak. 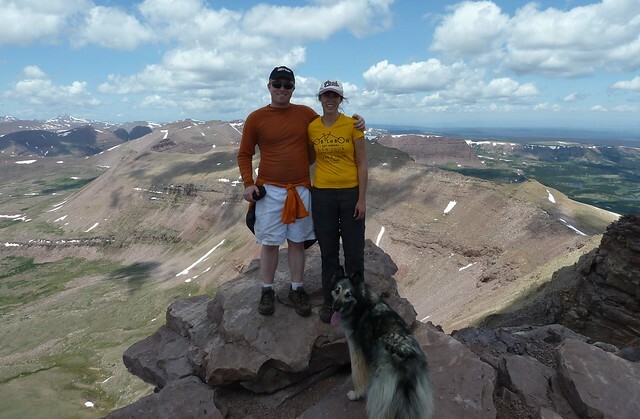 But instead of just hiking the peak we wanted to make a whole loop backpacking trip of it. The hike started easy and, other than the length (10 miles), never really got difficult. That first day we was Deer, Elk and Moose. We also passed 3 beautiful lakes before reaching our campsite. I had some technical difficulties with my camera (it wouldn't zoom) but a camera couldn't fully capture the beauty anyway. 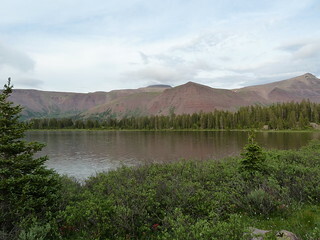 Out campsite at Henry's Fork Lake was fantastic and set us up for a great bid for Kings Peak the next day. I seem to be doing a lot of creek-fording lately. I guess I enjoy it. According to our neighbors at the lake, this ford could have been avoided with a little searching. Oh well. The cold water felt great on our sore feet. Summit Day! We got a late start for a summit day. 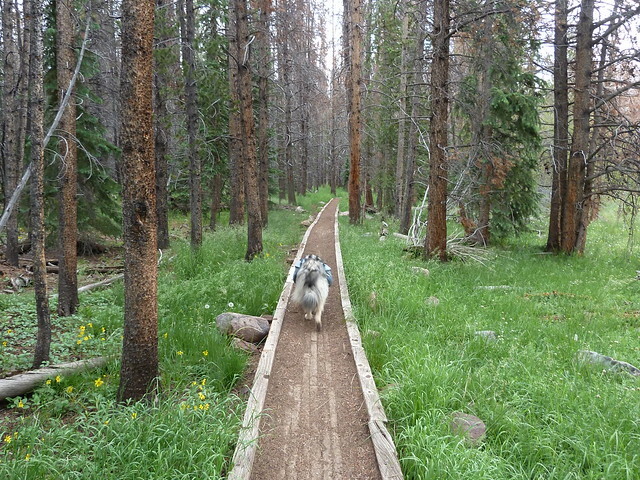 The beginning of the hike, through Henry's Fork Basin, was beautiful. Okay, the whole thing was beautiful. 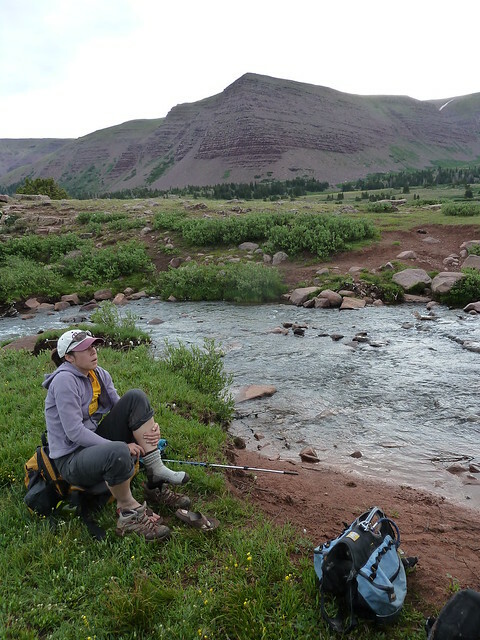 Still, Henry's Fork is a place to see and the the gentle nature of the trail allows plenty of opportunities to gaze across the expansive basin. 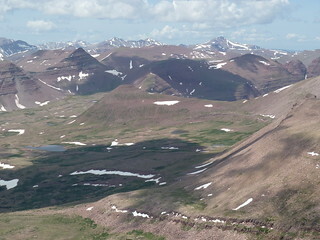 From Gunsight Pass we took the climbers shortcut over the shoulder of West Gunsight Peak. Here the difference between the experienced climbers and the croweds was evident. We found a route through the rocks that was rarely loose or difficult and put us no higher than we needed to go. Some other folks we saw scrambling up difficult sections that put them 100 or more feet above the shoulder - on the wrong peak! 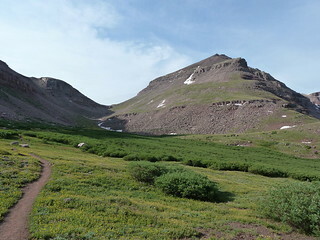 From the shoulder of West Gunsight to Anderson Pass was a pleasant hike back to the trail, then an easy climb to the pass. Tory and I had a snack at the pass, dropped our packs and made for the summit. It was slow going, and the weather kept threatening rain--a combination that made me anxious. But the weather held off and in time we were at the summit. We had the summit practically to ourselves, as most the crowds had come and gone. As we made our way down the weather began to clear up. I decided to take a shot at Henry's Fork Peak on the north side of Anderson Pass. I guess it would take me 40 minutes to get to the summit and back. As it turned out, it took closer to an hour. The summit was higher and further away than it looked. It was fun though, with a bit of an exposed ridge that was a nice change from Kings Peak. After the fun on the peaks we were pretty tired and ready for camp. We made our way down the west side of the pass and into the basin. In order to reach Lake 11428, we left the trail and cut across country for about 0.8 miles. 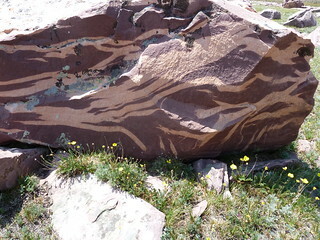 It was pretty easy as far as bushwhacking goes and the lake more than made up for any difficulties. Wind and rain started picking up and after a rushed dinner we ducked into the tent for a good night's rest. Day 3: Lake 11428 to China Meadows Trailhead. 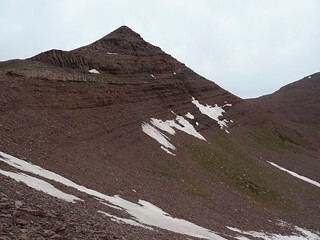 We woke up early enough to attempt Wilson Peak, another of Utah's 13ers. 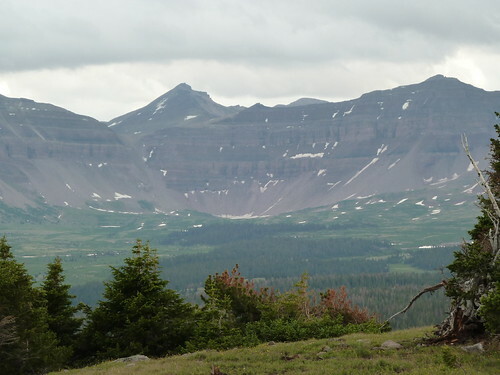 I was drawn to Wilson because of the view of Red Castle Lakes, Kings Peak and the Yellowstone Basin. 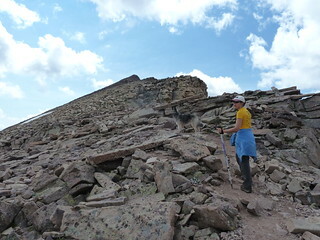 We climbed a bowl to the saddle between Wilson and East Wilson Peak, then scrambled up the class 3 southeast ridge to the summit. Both Tory and I agreed that Wilson was a more fun climb than Kings and were glad we went out of our way to climb it. 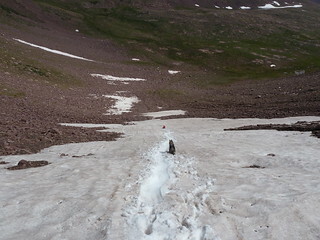 To top it off, on the way down we were treated to a perfect glissade down the lingering snow field in the bowl. After Wilson we came over Smiths Fork Pass then down past Smiths Fork Lake. 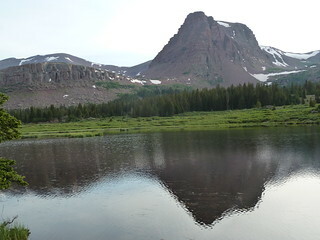 I really wanted to see East Red Castle Lake and Lower Red Castle Lake so at the outlet of Smiths Fork Lake we once again left the trail and went across country. 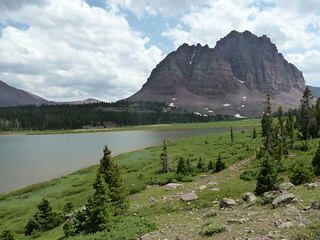 East Red Castle Lake was quick and easy to find and was stunning nestled underneath the ramparts or Red Castle. Getting to Lower Red Castle was a little trickier. The woods between the 2 lakes is a little tough to navigate. At times my GPS alerted me that I was heading exactly the wrong direction, despite the fact that it seemed I was going the right way. Once Lower Red Castle Lake was in view, however, we quickly made it down to the shore. 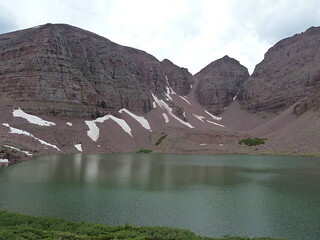 We forded the lake just below the inlet, took lots of pictures, and met back up with the Red Castle Lakes Trail. Our original plan was to camp at Lower Red Castle Lake but we were making such good time that we decided to camp further down the trail. Of course, when we got 'further down the trail' we were still making great time. My feet were getting seriously painful but Tory convinced me to continue all the way back to the car. In the end, it was worth the pain: not only did we have a bed and a shower at the Econolodge in Evanston that night, but we had enough time on Sunday to take the scenic road home. 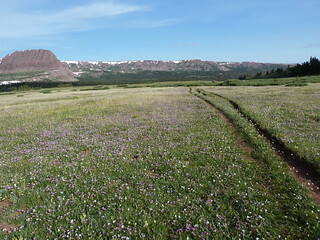 I'm glad we did Kings Peak as a backpacking trip because there are just so many wonderful places in the Uintas. 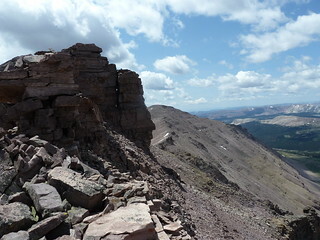 I highly recommend our route, especially Wilson Peak. If you would like more detailed information or a google earth track, please leave a comment or send me an email! Kings' Peak was Tory's (and Vuyo's) first State Highpoint! Go Tory! Thanks for subscribing. I want to provide the best content in a useful format. If you have any comments or suggestions, I would love to hear them. Contact me at mrjoutdoors@gmail.com.